Rose hip is the fruit that develops from the blossoms of the wild rose plant. It ranges in color from orange to purplish black and usually develops in the latter part of the growing season, around late summer to autumn. A common ingredient in herbal teas, rose hip is also available in supplement and powdered forms. Rose hip contains a number of important antioxidants (including vitamin C, vitamin E, beta-carotene, and lycopene) that are beneficial to your health. Alternative practitioners also believe that rose hip can prevent or treat a wide range of gastrointestinal and inflammatory symptoms. Rose hip is also known as rosehip, rose haw, hipberry, and hop fruit. It is called jin ying zi in traditional Chinese medicine, where it is used to stabilize the kidneys and stop diarrhea. In addition, rose hip is purported to strengthen the immune system, promote circulation, reduce inflammation, and even prevent heart disease. Some of these claims are better supported by research than others. A number of studies have suggested that rose hip may help treat symptoms of osteoarthritis ("wear-and-tear arthritis") and rheumatoid arthritis (an autoimmune form of arthritis). In a 2005 study published in the Scandinavian Journal of Rheumatology, researchers reported that a daily 5-gram rose hip supplement reduced osteoarthritis pain and the need for pain medications better than a placebo after three weeks of use. Meanwhile, a 2010 study in Phytomedicine found that rose hip supplements improved physical function in people with rheumatoid arthritis but did little to relieve the pain. Other studies have shown no beneficial effect. In a 2013 review published in Osteoarthritis and Cartilage, researchers concluded that rose hip was not effective in treating knee osteoarthritis and offered "uncertain" benefit in treating generalized osteoarthritis. Rose hip may help prevent heart disease in people with obesity, according to a small study in the European Journal of Clinical Nutrition. For this study, 31 people with a body mass index (BMI) greater than 30 were provided a daily tonic containing either rose hip powder or a placebo. After six weeks, the rose hip group showed greater improvement in the markers for heart disease—including systolic blood pressure and cholesterol levels—than the placebo group. On the flip side, they experienced increases in the vascular inflammation (as measured by the CRP and ESR tests) and no reduction in their diastolic blood pressure. Further research would be needed to determine if the benefits of treatment outweigh the risks. To date, there is no indication that rose hip is an effective weight loss supplement. Preliminary research indicates that rose hip may help prevent type 2 diabetes, particularly in people with risk factors such as obesity and high blood pressure. In a 2011 study in the American Journal of Physiology, scientists found that a 20-week course of powdered rose hip helped prevent diabetes in mice fed a high-fat diet, in part by reducing the accumulation of fat cells in the liver. According to the investigators, rose hip was able to normalize blood sugar levels and keep cholesterol in check. It has been hypothesized that compounds in the plant stimulate the growth of beta cells in the pancreas which are responsible for producing insulin. Despite the promising findings, there has been a near-total absence of research investigating the use of rose hip in humans with type 2 diabetes. Rose hip has been used for generations to treat diarrhea, stomach ulcers, and other gastrointestinal problems. There is growing evidence that this folk remedy may actually work. According to a 2017 review from the University of Zaragoza in Spain, rose hip appears to slow the contraction of the intestinal muscles nearly as effectively as the drug Lomotil (diphenoxylate) used to treat diarrhea. 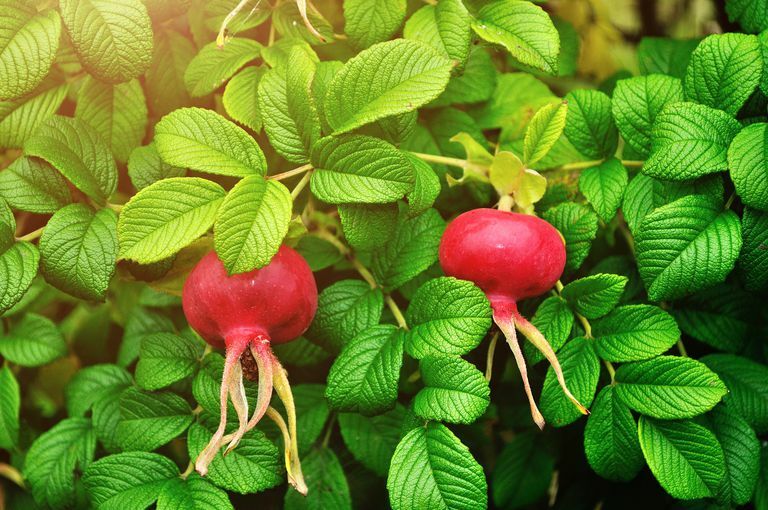 Rose hips also appear to reduce the risk of ulcers by altering the pH balance in the stomach. By doing so, it may create a hostile environment for Helicobacter pylori (H. pylori), the bacteria largely responsible for the development of ulcers. More research would be needed to confirm these results. Can Licorice Root Treat H. Pylori? Rose hip is generally considered safe but may cause side effects in some people, including nausea, diarrhea, constipation, heartburn, stomach cramps, fatigue, and headache. The risk tends to increase with larger doses. Other people have reported insomnia and unrestful sleep. Rose hip is known to cause certain drug interactions. Many of these are related to the high concentration of vitamin C in the plant. As such, you may need to avoid rose hip if you are taking estrogen-based contraceptives or the antipsychotic drug Prolixin (fluphenazine), both of which are affected by excessive doses of vitamin C.
Rose hip also has mild diuretic properties and may amplify the effects of pharmaceutical diuretics like Lasix (furosemide). This same effect may also reduce the concentration of lithium in the blood, potentially undermining the effectiveness of the mood stabilizer. Rose hip also contains a substance called rugosin E that promotes the formation of clots. You should avoid rosehip if you've ever had deep vein thrombosis (DVT), pulmonary embolism, or other conditions involving blood clots. It is possible that rose hip can also decrease the efficacy of blood thinners like warfarin used to prevent or treat cardiovascular diseases. Due to the lack of safety research, rose hip should not be used in children, pregnant women, or nursing mothers. There are no guidelines directly the appropriate use of rose hip. Due to concerns about the risk inflammation, the long-term use of rose hip is not advised. Rose hip capsules are generally sold in 500-milligram to 1,000-milligram doses and are considered safe if taken within this range. Doses over 2,000 milligrams may increase the risk of side effects, particularly if the supplement is co-formulated with vitamin C.
Do not confuse rose hip extract with either rose or rose hip essential oil. Rose hip extracts and tinctures are typically alcohol-based and may be used internally. Essential oils are intended for aromatherapy or external use only. As a general rule of thumb, never exceed the recommended dose on the product label. As a dietary supplement, rose hip does not need to undergo the rigorous testing and research that pharmaceutical drugs do. Because of this, the quality of a supplement can vary. To ensure quality and safety, choose supplements that have been tested and approved by an independent certifying body like the U.S. Pharmacopeia (USP), ConsumerLab, or NSF International. Whole dried rose hips or rose hip powder should ideally be certified organic under the regulations of the U.S. Department of Agriculture (USDA). Can you harvest your own rose hips? Fresh rose hips can be harvested from any type of rose, but the rugosa rose (Rosa rugosa) is the species that is most commonly used for medicinal purposes. It is also said to have the best flavor, with a tartness reminiscent of a crab apple. Pick the berries as late in the season as possible before they start to shrivel up. Avoid those that have been eaten or are blemished; instead, choose the plumpest berries that have good color and are still shiny. You should not harvest rose hips from bushes that have been treated with pesticides. Even if you wash them thoroughly, there is still a chance of toxic exposure. Once harvested, wash the rose hips thoroughly before using them to make syrups or tea. If you intend to dry them, it is often safer to do so with a commercial dehydrator than by air. Air-drying risks exposure to airborne contaminants and rotting. Andersson, U.; Berger, K.; Högberg, A. et al. Effects of Rose Hip Intake on Risk Markers of Type 2 Diabetes and Cardiovascular Disease: a Randomized, Double-Blind, Cross-Over Investigation in Obese Persons. Eur J Clin Nutr. 2011 Dec 14;66(5):585-90. DOI: 10.1038/ejcn.2011.203. Marmol, I.; Sanchez-de-Diego, C.; Jimenez-Moreno, N. et al. Therapeutic Applications of Rose Hips from Different Rosa Species. Int J Mol Sci. 2017 Jun;18(6):1137. DOI: 10.3390/ijms18061137. McAlindon, T.; Bannuru, R.; Sullivan, M. et al. OARSI guidelines for the non-surgical management of knee osteoarthritis. Osteoarthritis Cartilage. 2014;22(3):363-88. DOI: 10.1016/j.joca.2014.01.003. Willich, S.; Rossnagel, K.; Roll, S. et al. Rose Hip Herbal Remedy in Patients With Rheumatoid Arthritis - a Randomised Controlled Trial. Phytomedicine. 2010 Feb;17(2):87-93. DOI: 10.1016/j.phymed.2009.09.003. Winther, K.; Apel, K.; and Thamsborg, G. A Powder Made From Seeds and Shells of a Rose-Hip Subspecies (Rosa Canina) Reduces Symptoms of Knee and Hip Osteoarthritis: a Randomized, Double-Blind, Placebo-Controlled Clinical Trial. Scand J Rheumatol. 2005 Jul-Aug;34(4):302-8. DOI: 10.1080/03009740510018624.